Expression levels of ER alpha protein vary with sample type. ab32063 is unsuitable to test ovary and the tissues with low expression level of Estrogen Receptor alpha, such as kidney, lung and brain, in western blot. And it failed to show good IHC signal on mouse and rat tissue sections when using our IHC testing conditions. For our in-house testing we tested the antibody on a mouse tissue array (breast, spleen, lung, stomach, muscle, pancreas, liver, colon, brain, kidney). Synthetic peptide within Human Estrogen Receptor alpha aa 50-150. The exact sequence is proprietary. WB: MCF-7 and T47-D cell lysates. 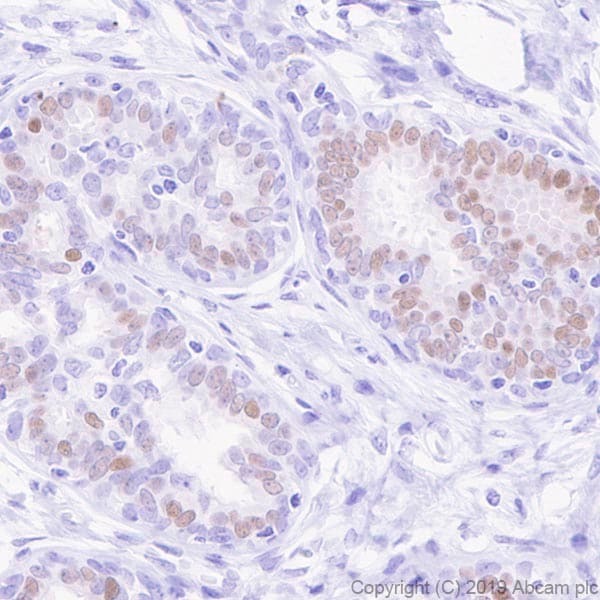 IHC-P: Human breast carcinoma and endometrial carcinoma tissues; human endometrium and breast tissues. ICC/IF: MCF-7 cells. Flow Cyt: MCF-7 cells. Our Abpromise guarantee covers the use of ab32063 in the following tested applications. We recommend to use a 30 min blocking step (1XPBS/10%goat serum/0,3M Glycin). ChIP Use 4 µg for 25 µg of chromatin. WB 1/1000. Detects a band of approximately 60 kDa (predicted molecular weight: 67 kDa).Can be blocked with Estrogen Receptor alpha peptide (ab203371). For unpurified, use 1/50 - 1/100. The antibody failed to show good IHC signal on mouse and rat tissue sections when applied using our IHC testing conditions. Immunohistochemical staining of paraffin embedded human endometrium tissue with ab32063 at a dilution of 1/5000. The secondary antibody used was Goat Anti-Rabbit IgG H&L (HRP Polymer). The sample is counter-stained with hematoxylin. Antigen retrieval was heat mediated using ab93684 (Tris/EDTA buffer, pH 9.0). Nuclear staining on human endometrium. Immunocytochemistry/Immunofluorescence analysis of MCF-7 cells labelling Estrogen Receptor alpha with purified ab32063 at 1/1000. Cells were fixed with 4% paraformaldehyde and permeabilized with 0.1% Triton X-100. ab150077, an Alexa Fluor® 488-conjugated goat anti-rabbit IgG (1/1000) was used as the secondary antibody. The cells were co-stained with ab7291, a mouse anti-tubulin (1/1000) using ab150120, an Alexa Fluor® 594-conjugated goat anti-mouse IgG (1/1000) as the secondary antibody. Nuclei counterstained with DAPI (blue). Control 1: primary antibody (1/1000) and secondary antibody, ab150120, an Alexa Fluor® 594-conjugated goat anti-mouse IgG (1/1000). The expression level of ER66 is high in uterus, moderate in ovary and low in kidney, lung, brain, liver, heart (PMID: 20861365, 24977106, 23675257, 23940668, 22070562), especially low in the tissues from male or young female animals (PMID: 26384003, 23940668). ab32063 is unsuitable to test ovary and the tissues with low expression level of Estrogen Receptor alpha in western blot. Immunohistochemical staining of paraffin embedded human breast tissue with ab32063 at a dilution of 1/5000. The secondary antibody used was Goat Anti-Rabbit IgG H&L (HRP Polymer). The sample is counter-stained with hematoxylin. Antigen retrieval was heat mediated using ab93684 (Tris/EDTA buffer, pH 9.0). Nuclear staining on human breast. 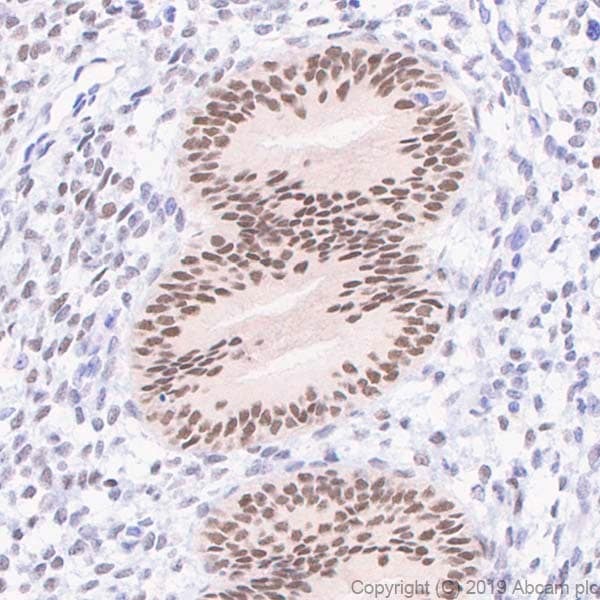 Immunohistochemical staining of paraffin embedded human breast carcinoma tissue with ab32063 at a dilution of 1/5000. The secondary antibody used was Goat Anti-Rabbit IgG H&L (HRP Polymer). The sample is counter-stained with hematoxylin. Antigen retrieval was heat mediated using ab93684 (Tris/EDTA buffer, pH 9.0). Nuclear staining on human breast carcinoma. Overlay histogram showing MCF7 cells stained with unpurified ab32063 (red line). The cells were fixed with 4% paraformaldehyde (10 min) and then permeabilized with 0.1% PBS-Tween for 20 min. The cells were then incubated in 1x PBS / 10% normal goat serum / 0.3M glycine to block non-specific protein-protein interactions followed by the antibody (ab32063, 1/1000 dilution) for 30 min at 22°C. The secondary antibody used was Alexa Fluor® 488 goat anti-rabbit IgG (H+L) (ab150077) at 1/2000 dilution for 30 min at 22°C. Isotype control antibody (black line) was rabbit IgG (monoclonal) (1μg/1x106 cells) used under the same conditions. Unlabelled sample (blue line) was also used as a control. Acquisition of >5,000 events were collected using a 20mW Argon ion laser (488nm) and 525/30 bandpass filter. This antibody gave a positive signal in MCF7 cells fixed with 80% methanol (5 min)/permeabilized with 0.1% PBS-Tween for 20 min used under the same conditions. Immunohistochemical staining of paraffin embedded human endometrial carcinoma with purified ab32063 at a working dilution of 1 in 200. The secondary antibody used is ab97051, a HRP goat anti-rabbit IgG (H+L), at 1/500. The sample is counter-stained with hematoxylin. Antigen retrieval was perfomed using Tris-EDTA buffer, pH 9.0. Immunofluorescent staining of MCF7 cells (fixed with 4% PFA and permeablized with TritonX 100) with purified ab32063 at a dilution of 1/250. An Alexa Fluor® 555 goat anti-rabbit antibody was used as the secondary at a dilution of 1/200. The panel on the right shows the DAPI counter-staining. Chromatin was prepared from MCF-7+β-estraiol 30 min, and MCF-7 cells according to the Abcam X-ChIP protocol. Cells were fixed with formaldehyde for 10 min. The ChIP was performed with 25 μg of chromatin, 4 μg of purified ab32063 (blue), and 20 μLl of anti-rabbit IgG sepharose beads. Rabbit normal IgG was added to the beads control (yellow). The immunoprecipitated DNA was quantified by real time PCR (SYBR approach). Primers are located in the 2nd intron of TFF1 gene. MCF-7 starved overnight, then treated with 10 nM β-Estradiol in 2% FBS media for 30 min. Control MCF-7 was starved overnight, then in 2% FBS media for 30 mins. Located to the 2 intron of TFF1 gene. ChIP analysis using unpurified ab32063 binding Estrogen Receptor alpha in MCF7 cells derived from Human breast carcinoma. Cells were cross-linked for 10 minutes with 1% formaldehyde. Samples were incubated with undiluted primary antibody for 16 hours at 4°C. Protein binding was detected using real-time PCR. Publishing research using ab32063? Please let us know so that we can cite the reference in this datasheet. 1. The secondary antibodiesn that I used are Goat anti rabbit dy light 488, procured from xxxxx and the other was goat anti mouse Cy3, procured from xxxxxx. 2. These antibodies have been successfully used in our lab for fluorescent staining. 3. Am still performing validation of primary antibodies procured from you (Abcam: Ab32063 & Ab16813). All the experiments have been done on uterus tissue which is positive for both Er alpha and ER beta expression. 4. Microwave heating with sodium citrate buffer at pH 6.0 was used for the antigen retrieval. 5. Blocking was performed by adding 3% Fetal calf serum and 5% Normal goat serum in PBS with 0.1 triton and incubated for 60 min at room temperature. 6. Use of tritonated PBS itself was considered as a methed for permeabilization. 7. At each sted slides were washed 3 times with PBS. If you any further question please do not hesitate to contact me by mail or by phone. Thank you for your detailed reply. That has been very helpful. I have a few suggestions to make which may improve the results currently observed, or at least allow us to understand what may be contributing to the problems. I would firstly try to reduce the non-specific background you have been seeing with the secondary antibodies. This would involve trying the staining again with just the secondary antibodies but optimising the conditions to reduce the non-specific binding you have been seeing. This could involve reducing the concentration of secondary antibody used and the blocking solutions used. I would initially just try with the goat serum at 10% for blocking (as mixing blocking types can lead to increased background) with 0.1% Tween 20. I would also introduce 1% goat serum to the antibody diluents (as well as 0.1% Tween 20). You may also want to consider using a different blocking agent altogether, such as 3% BSA. If this does not improve the results, you may also want to look into optimising the antigen retrieval used. Too much antigen retrieval can lead to higher background staining. Another thing to consider is that the ab16813 is of the isoform IgM and I do not think the antibody you are currently using is able to detect this isotype. I would therefore suggest using a secondary antibody specific for mouse IgM. Once the background has been reduced it may be worthwhile to introduce a separate permiabilisation step when using the primary antibodies to ensure good penetration of the two antibodies into the tissue. You could use 0.2% Triton in PBS for 10 minutes. I hope this information has been of some help. I would be very interested to hear how you get on. As per our talk over the phone, here are the images of the double staining attached. Tissue collection: The tissues used were rat uterus. When the rat was alive she was perfused with PBS followed by 4% PFA. Tissues collected and stored in the 4% PFA for couple of day and the dehydrated with 20% sucrose solution. The dehydrated tissues crayo-frozen and stored at -80. Tissue preparation: The frozen tissues were sliced with 10 micro meter thick and fixed on a glass slide by 4% PFA for 10 mins. The washed with PBS (3 times). Antigen retrieved in a microwave for 10 mins then washed with ice cold PBS (2 time). The slided were blocked by 5% NGS and 3% FCS. The primary antibodies in 0.1% trinton in PBS with 1% FCS and 1% NGS. Incubated overnight at 40 C (For confirming the axact dilutions needed we tried 1:100,1:200 and 1:400 and for double staing we used 1:400). On day two the secondary antibodies were added for ER alpha (Ab32063) FitC goat anti rabbit antibody (1:250) and for ER beta Cy3 goat anti mouse antibody (1:250) was used. Incubated for 90 mins and washed with PBS and then added was Hoescht dye (1:1000). Then washed again with PBS and finally with DM water and mounted with mowiol. Images were captured at 20X and also viewed under 40X oil emmersion (No difference). Images attached are all for double staining. Wherein I have split the images with different fluorecence and also a double fluoroscence imaged. 1. As Estrogen receptors belong to the nuclear receptors and it should stain nucleus largely but both the anti bodies does not show any staining into the nucleus. 2. Also, I see that in my blank slides, I see artifacts of fluorescence which is expected to at the region where I expect protein expression, which is one of the difficult situation to analyse my results. Do you have any suggestion for secondary antibodies? Thank you for sharing that information with me and sorry for the delay in getting back to you. This makes understanding the problems you have encountered easier. 1. The ER alpha and beta would be expected to be located in the nucleus however, it is difficult to tell if you are seeing any specific nuclear staining considering the background staining your are seeing with the secondary antitbodies alone. 2. I would agree that the background you are seeing is making it difficult to interpret the results. I think I'd like to collect a little more information from you in order to be able to advise how to improve the results. If you could let me know which secondary antibodies you are using (the supplier and catalogue number) this would be helpful. Have these secondary antibodies been used successfully with any other primary antibodies? Have you performed any staining of any other targets in the tissue? Which antigen retrieval buffer was used? How long was the blocking performed for (and at what temperature)? Was any permiabilization performed? If so, how? What wash steps were employed between each antibody incubation? With this information I will hopefully be able to advise as to what may be worth optimising and hopefully reduce the background staining. We have a quality issue for item ab32063. Please check attachment for detail. Thank you for contacting us. I am sorry this antibody is giving no signal in WB. Have you validated your transfer for proteins around this MW? I would recommend performing a Ponceau stain to double check that the protein is present on the membrane because the run and transfer conditions you are using are generally more suited to smaller proteins. It may also help to reduce the concentration of blocking agent in the antibody diluents. Milk should be kept to a concentration of 1% with the primary antibody and removed from the secondary antibody buffer. It is possible that the extra protein may be competing with the antibody and thereby inhibiting the binding. How long was your exposure time? Have you tried overexposing the blot to see if there are any background bands detected? How long were your wash steps? Washes should be kept to 3x 5 minutes to prevent a reduction of signal. I hope this helps to improve your results, if not, please let me know and I will be happy to help you further. - Would like to use antibodies in double Immunofluorescence. Please check the Abpromise guarantee for these products. I will look forward to receive your order soon. Thank you for your quick reply. Your suggestion for performing individual staining beforehand is appreciable. AsI will use frozen tissue of rats to perform the double fluorescence staining and not by paraffin blocked tissue. I was able to find some info for the other antibodies that were used for frozen tissue and not fot the antibodies that I requested. So, could you also, confirm me about the usability of the same antibodies for the frozen tissue. Both antibodies detect rat species and recognize the native form of Estrogen Receptor alpha and beta. These antibodies have been tested on formalin-fixed paraffin-embedded tissue sections and it is very likely that they are suitable for IHC on frozen sections as well. Generally speaking, if an antibody is applicable in IHC-P, it is very likely to work in IHC-Fr. However, if the antibody has only been tested in IHC-Fr, we can't predict the suitability for IHC-P.
Am planning to perform fluorescent immuno stating with two estrogen receptor antibodies on the same sample tissue slide. From your catalogue (online), I found that ab32063 (ER alpha) and ab16813 (ER beta) as the most compatible primary antibodies. I have no much idea about immunostaining could please provide me with more details about the dilutions and the method that i can impliment to perform simultaneous fluorescent immunostaining. Also, could you provide me with the quotation for these above said antibodies (with offers if any). I can confirm that both antibodies (ab16813 and ab32063) have been tested for IHC-P so they should work in immunofluorescence. Since their host species and the isotypes are different (ab16813 mouse IgM and ab32063 rabbit IgG), they can be applied in double staining with compatible secondary antibodies. Before you perform double-staining, I would suggest using the antibodies in single staining to make sure that the procedure works well. Once you can detect the two targets nicely, you could carry on with the double-staining on the same samples. What is the concentration of lot GR45586-2? The concentration for ab32063, lot GR45586-2, is 1.06 mg/mL. I hope this helps. Please contact me again if you have any further questions. Weak staining in MCF7 cells. Hopefully the protocol tips that we talked about today will help improve the weak signal you are seeing using ab32063. The protocol tips that we discussed are: Fix in 4% PFA for 10 minutes in room temperature. Use 1/50 dilution of the primary antibody. Try a different secondary antibody. Please let me know if you are still having issue with the antibody after trying out the above tips. If there is anything else I can do please let me know. 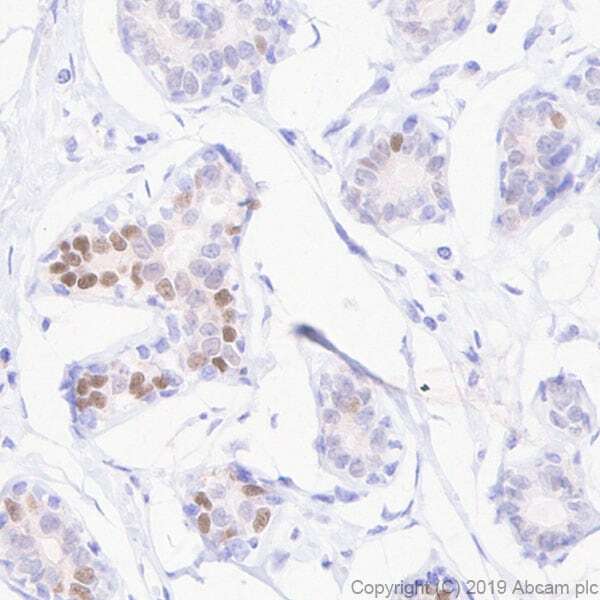 Having read the previous enquiries for this antibody, I would like to know whether this antibody has been successfully tested for IHC on rat formalin-fixed, paraffin-embedded tissue and if you had any images of this staining? I apologize for the delay in answering your question, I went back to the lab that tested the antibody to get clarification on testing in rat and have not obtained a clear answer or image on rat IHC. I can confirm that the antibody does cross react well in western blotting with rat and mouse samples, but I am not confident that it works well in IHC. I have clarified this information on the datasheet and apologize once again for the delay. Thank you for your enquiry. I have been in correpondence with the lab and I have a more complete picture of this antibody's reactivity. Whilst this antibody showed positive staining against mouse, rat, and human tissue preparations by western blotting, the antibody failed to show positive IHC signal on mouse tissue sections when applid using our in-house IHC testing conditions. For our in-house testing we tested the antibody on a mouse tissue array (spleen, lung, stomach, muscle, thymus, pancreas, liver, small intestine, brain, kidney).